This is the perfect breakfast bread: moist, sweet (but not overly sweet), and chockful of orange flavor and juicy, plump blueberries. Your standard quick-bread recipe, this loaf is extremely easy to make and only requires ingredients that are standard in most kitchens. Rather than using regular orange juice as suggested in the recipe (sorry Florida's Natural), I used fresh squeezed juice which I'm sure provided an even more authentic orange flavor, on top of the nice amount of orange zest included in the batter. I used fresh blueberries (they were on sale), and the mild flavor of these berries was a perfect pairing with the tangy orange. 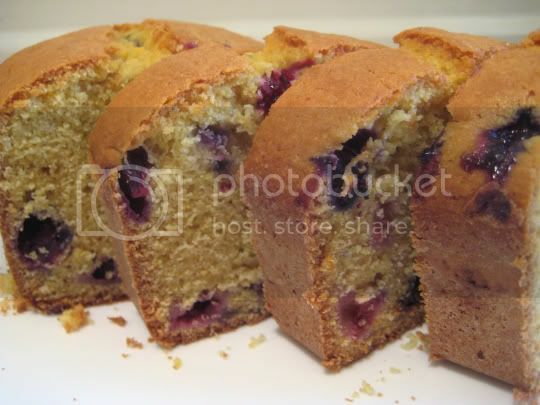 You do not need to use the full 2 tablespoons of flour that is suggested to be tossed with the berries (you will end up throwing most of this away); just make sure that your berries are tossed with enough flour to evenly coat them all. Not only was this loaf delicious warm out of the oven, but the leftovers were just as tasty days later. Make again? Yes, this one's a keeper.